Lateral jets can be used in place of control vanes and articulated surfaces for supersonic missile control. The main advantages of lateral jets are faster response times and control effectiveness at high altitudes where the low air density reduces the effectiveness of conventional controls. However, the flowfield around a jet in crossflow is quite complex with shock waves, separated flow, shear layers, and vortices all interacting to affect the control forces. In this study, Pointwise and CFD++ are used to analyze the flow around a lateral jet on a generic supersonic missile that has been tested at the DLR TMK trisonic wind tunnel in Cologne, Germany. 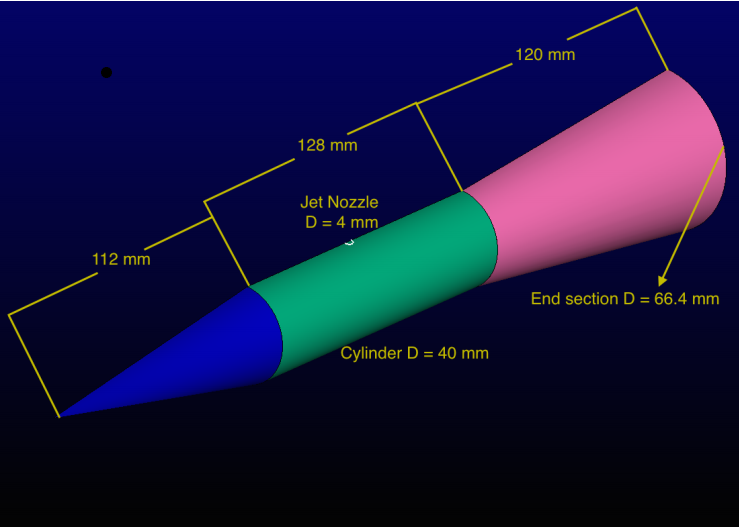 The missile geometry, shown in Figure 1, consists of a 10.3 degree half-angle cone forebody, followed by a 40 mm diameter cylindrical body, then a flared afterbody section. The lateral jet has a diameter of 4 mm (one tenth of the body diameter), and it is located 4.3 body diameters from the missile's nose. Details of the geometry can be found in Reference 1. The computations were done for three angles of attack: 0, -5, and 10 degrees. The freestream conditions were M = 2.8, static pressure = 20,793.2 Pa, and static temperature = 108.96 K. Lateral jet exit conditions were total pressure = 2,079,320 Pa and total temperature = 280 K. Experimental data are available along three axial lines: along the upper symmetry plane and at 30 degrees and 60 degrees off the symmetry plane. Figure 1: The generic supersonic missile geometry includes a 4mm diameter lateral control jet. In order to achieve the highest accuracy results, a multi-block structured grid was used for these computations. The wall spacing on the missile body was 1.5 x 10-7 meters and inside the jet nozzle the wall spacing was 2.5 x 10-6 meters. The entire mesh, shown in Figure 2, consists of 3.6 million cells. Figure 2: The entire multi-block structured mesh (half-symmetry geometry) contains 3.6 million cells. Several areas of the mesh required special handling. 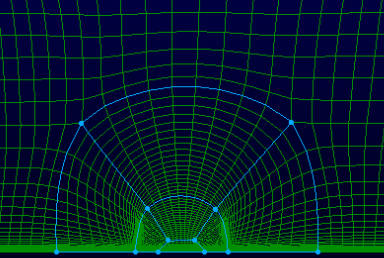 To avoid a mesh singularity (pole) point at the missile's sharp nose a waffle topology was created by placing a structured grid domain on the nose with a computational corner in the middle of its otherwise straight circumferential edge as shown in Figure 3 for the top half of the grid. This creates some skewed surface cells, which are easily cleaned up by applying Pointwise's elliptic PDE-based smoothing algorithms. The resulting improved mesh on both the top and bottom halves of the nose can be seen in Figure 4. Figure 3: Singular point at the nose is replaced with a new surface grid with an extra computational corner along the back edge. 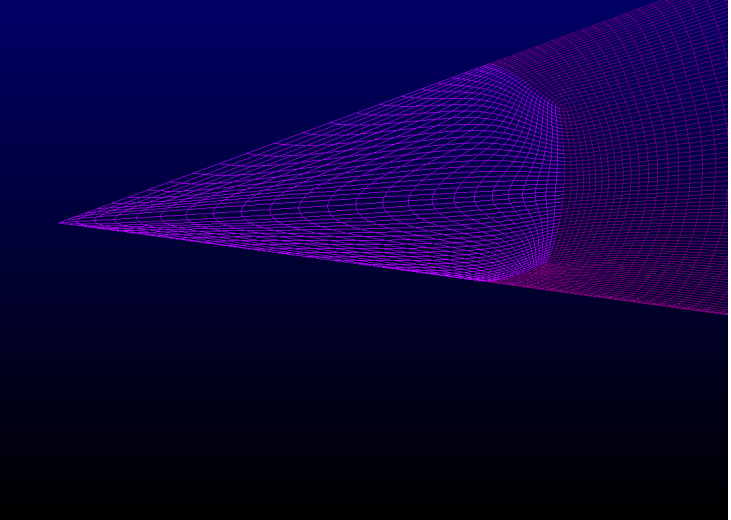 Figure 4: Applying Pointwise's surface-constrained elliptic PDE smoothing quickly improves mesh quality. Another area that benefits from some special handling is the exit nozzle of the lateral control jet. It has a circular cross-section that sits in the middle of the missile body, which appears locally rectangular in terms of mesh topology. To avoid a mesh singularity running down the middle of the nozzle, as would be the case if an O-mesh topology was used and to smoothly transition from the naturally circular topology of the jet nozzle to the rectangular background topology of the missile body, the jet nozzle is meshed with an O-H, or butterfly, topology with an H-grid in the center of the nozzle surrounded by an O-grid on the boundary of the nozzle. The resulting block topology is shown in Figure 5. 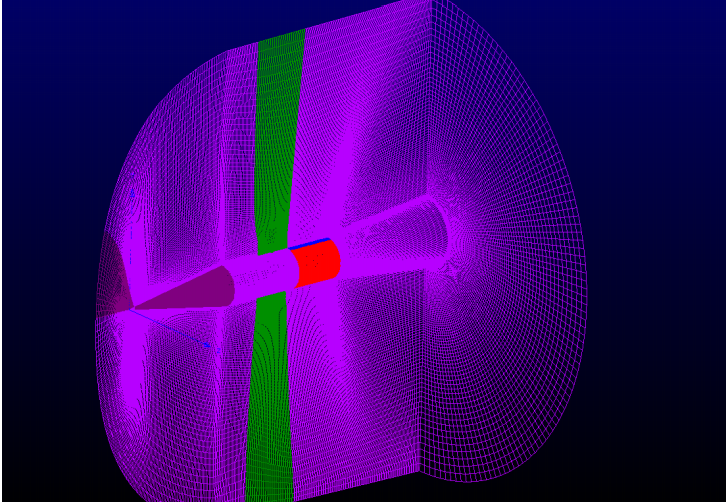 Figure 5: A butterfly topology in the jet nozzle avoids mesh singularities and interfaces with the missile body grid. 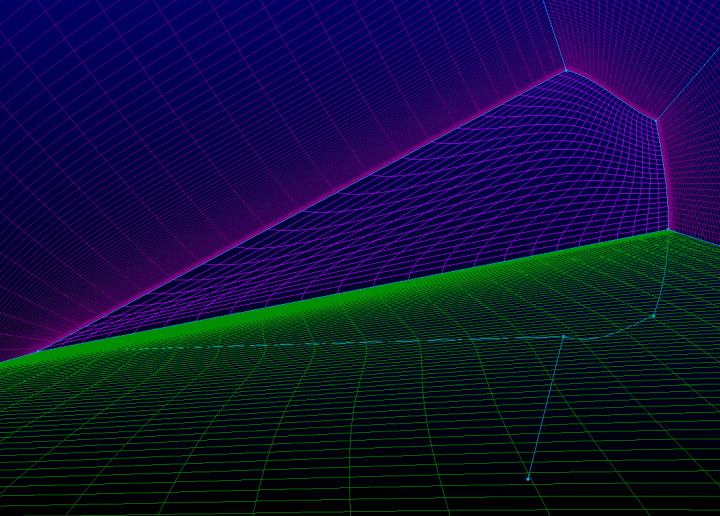 Figure 6 shows how the grid lines from the nozzle transition to the overall missile grid on the symmetry plane. 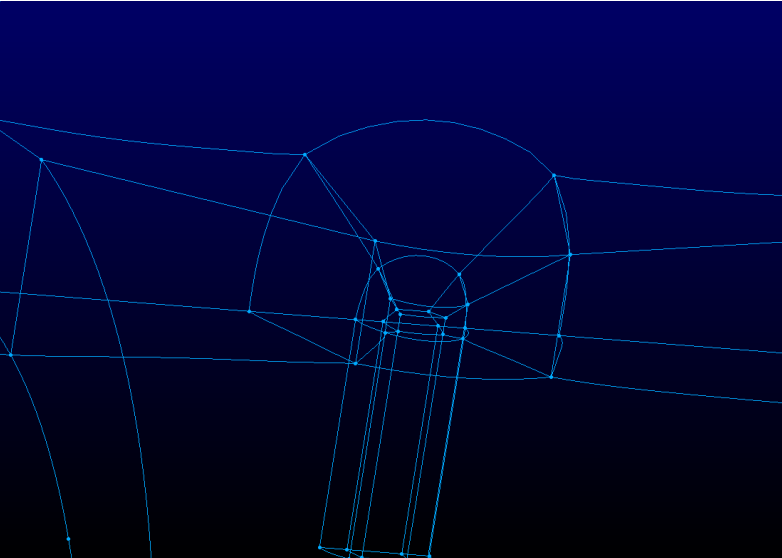 Figure 6: The O-H topology mesh from the jet nozzle matches with the missile body grid. CFD++ from Metacomp Technologies, Inc. was used for the CFD (computational fluid dynamics) computations of the control jet in supersonic crossflow. It is a general Navier-Stokes solver suitable for both internal and external flows and flow speeds from incompressible to hypersonic and includes a variety of physical models for phenomena such as multiphase (including dispersed phases), evaporation and condensation, chemical reactions, porous media, free surfaces, and radiation. For the present calculations, the Reynolds-averaged Navier-Stokes equations were solved along with two different turbulence models: a 2-equation realizable k-epsilon and a 2-equation SST. 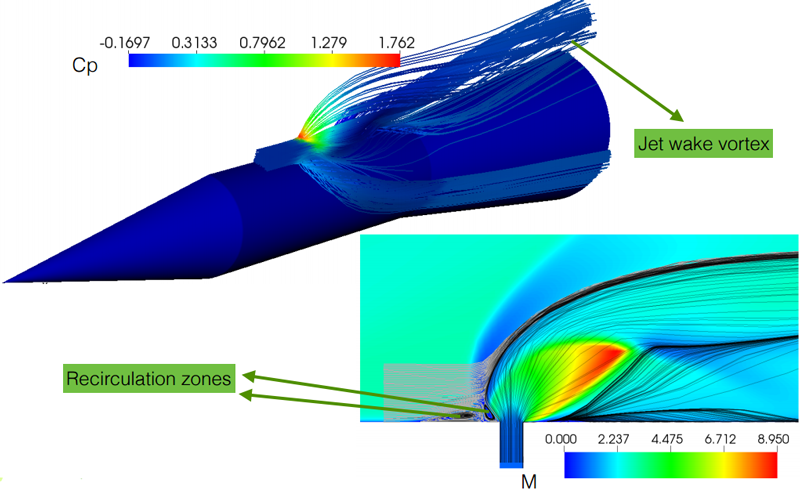 The overall flowfield for the zero angle of attack case is shown in Figure 7. The upper portion of the figure shows the missile surface and streamlines near the control jet both colored by pressure coefficient. A vortical structure is apparent in the jet wake and horseshoe vortex, caused by flow from the jet blocking the freestream flow, can also be seen propagating along the side of the missile. The lower portion of the figure shows Mach contours and streamlines on the symmetry plane near the jet. This shows the area of separated flow in front of the jet and the bow shock caused by the jet blockage effects. Figure 7: CFD++ results for the 0 degree angle of attack case show the flow structures around the control jet. The convergence history for the zero angle of attack case in Figure 8 shows that all residuals dropped by at least 5 orders of magnitude in less than 800 iterations, demonstrating the robustness of CFD++ and the quality of the grid. 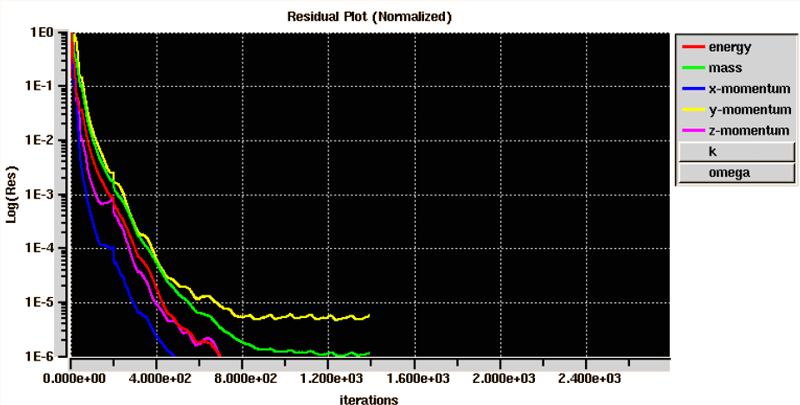 Figure 8: All residuals dropped by at least 5 orders of magnitude. Comparisons with the experimental pressure coefficient data are shown in Figure 9. The three columns are 0 degrees, -5 degrees, and 10 degrees angle of attack from left to right. The top row shows pressure coefficients along the upper symmetry plane, the middle row shows 30 degrees off the symmetry plane, and the bottom row shows 60 degrees off the symmetry plane. For the 0 degree angle of attack case, both the k-epsilon and SST turbulence models were used and gave similar results. The agreement with experimental data is good for all the cases. 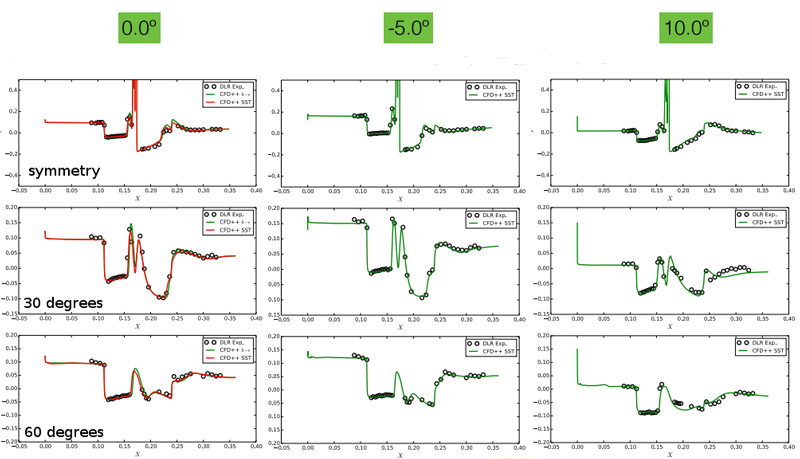 Figure 9: Pressure coefficients from CFD++ show good agreement with experimental data. While this is a relative simple geometry, the resulting flowfield is complex, with multiple vortices, shock waves, shear layers, and separation bubbles. Consideration must be taken when building the grid to make sure it is high enough quality and provides the resolution needed to capture relevant flow physics. 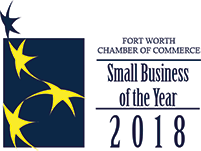 Pointwise and CFD++ together were able to provide the modeling required to get accurate results.